Stanton died May 14, 2015 at Santa Barbara Cottage Hospital from complications of a fall. He had been undergoing treatment for a rare form of leukemia since January. He was 78 years old. Stan was born January 23, 1937 in Indianapolis, IN the youngest of five children born to Robert F. and Edith Mae Murphy Peale. He attended schools in Southport, IN and graduated from Southport High School in 1955. In 1959 he received his B.S. degree in Engineering Sciences with highest distinction from Purdue University. Stan received an M.S. in 1962 and a Ph.D. in 1965 from Cornell University. He met Priscilla L. Cobb in 1959 at Cornell and they were married in Boston, MA on June 25, 1960. Sons Robert and Douglas were born in Ithaca, NY in 1961 and 1963 respectively. In 1964 he was a research associate at Cornell’s Center for Radio Physics and Space Research. In September, 1965 he became an assistant professor in the Department of Astronomy and the Institute of Geophysics and Planetary Physics at UCLA. He transferred to the Department of Physics at UCSB in September, 1968 and retired from UCSB as professor emeritus in 1994. He continued as a research professor mentoring post doctoral fellows and actively doing research until his death. His last paper was submitted to a scientific journal for publication on May 11, just three days before his death. His research included the prediction of widespread volcanism on Jupiter’s moon Io, the derivation of a general theoretical framework that governs the rotational states of bodies subject to tides, the study of tidal evolution in satellite systems, and the development of an ingenious procedure to determine the size and state of Mercury’s core. He was also a pioneer in the study of extrasolar planets, both in terms of their dynamics and their detection by microlensing. Stan’s work illustrated the power of physics to probe the interiors of planets. He was honored by being named a Fellow of the American Association for the Advancement of Science in 1981, Fellow of the American Geophysical Union in 1988, and by having an asteroid named Peale 3612 also in 1988. 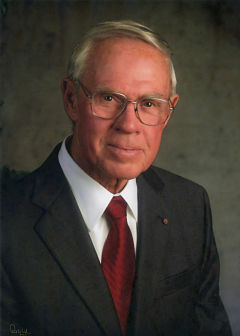 His research was recognized by the Newcomb Cleveland Prize of the American Association for the Advancement of Science in 1979, the NASA medal for exceptional scientific achievement in 1980, the James Craig Watson award of the National Academy of Sciences in 1982, the Dirk Brouwer Award of the Division of Dynamical Astronomy of the American Astronomical Society in 1993, and membership in the National Academy of Sciences in 2009. Stan was preceded in death by his parents, sister Wilma Mills, and brothers Robert J. and John C. Peale. He is survived by his wife of 54 years, Priscilla of Goleta, son Robert E. Peale, daughter-in-law Melinda A. Wright, grandson Christian Alexander Peale all of Winter Park, FL and son Douglas A. Peale of San Jose, CA. Other survivors include his sister Virginia of Indianapolis, IN, sister-in-law Mildred Peale of Thousand Oaks, CA, two nephews and three nieces. On Friday, August 14, 2015 there will be a graveside service at Goleta Cemetery, 44 S. San Antonio Road, Santa Barbara, CA at 2 p.m., and a celebration of life reception will follow at the family home at 3 p.m.